Well, now is as good a time as any to talk about it, because it sure is rolling in! If you spent any time on our South Shore Beaches over the weekend, you will know what I am talking about. On Warwick Long Bay and Church Bay especially, piles of yellow and orange seaweed were stretched along the high tide line, and if you looked past the reef line, you could see more of it out there swirling about in huge tangled floats. This seaweed is, of course, Sargassum seaweed, and it comes to us from the Sargasso Sea. Approximately 700 miles wide and 2000 miles long, the Sargasso Sea is located within the Atlantic Ocean. It is the only sea in our world that does not have land as borders. The sea is named after the Sargassum seaweed that grows in it. While most seaweeds grow from the Ocean floor, Sargassum seaweed floats on the ocean’s surface forming massive, thick floating mats. Normally Sargassum seaweed remains within its ocean locked boundaries, but depending on strong winds and seasonal currents, pieces of it can break free and drift throughout the Atlantic Ocean. Occasionally, like right now, it finds itself on Bermuda’s shores. I think it would be safe to say that for most tourists, islanders and beach managers and employees it is most unwelcome, but I love it. Why? Those annoying orange and yellow clumps are full of life. Any kid who has spent time on a beach in Bermuda when Sargassum seaweed has washed in will probably be able to tell you that things, especially crabs, live in it. 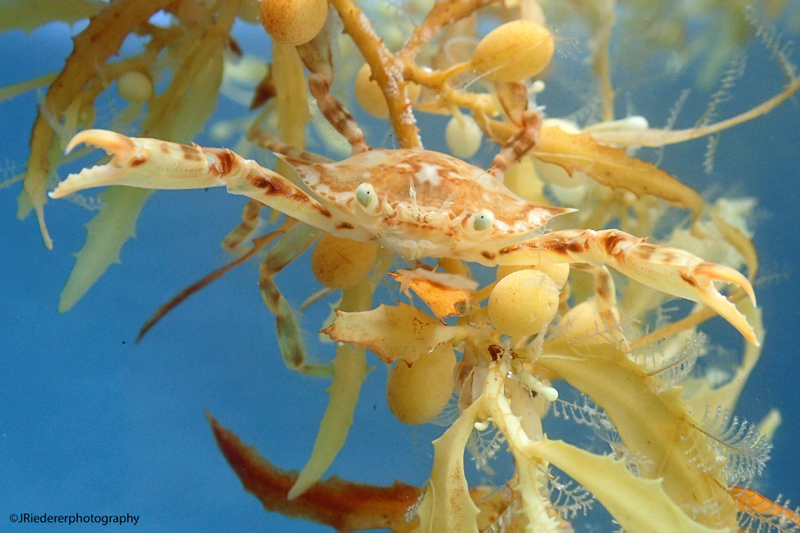 It is not just crabs that live in the Sargassum though. The floating mats, sometimes three feet thick, provide a unique habitat that many different species have evolved to live amongst. Some of these animals can be found in no other ocean habitat, and unless you traveled in a boat way out into the Sargasso Sea, you would never have the opportunity to see them – until the Sargassum is washing into our shores. One of my favorite animals to find amongst the floating seaweed is the Sargassum fish. These frog fish can be found in even the smallest clumps of seaweed. You could stare into a floating clump of Sargassum for as long as you like though and it would be very unlikely you would see a Sargassum fish, as they are one of the most spectacularly camouflaged animals in our ocean. As you can see from this tiny fish, just one cm in length, they are incredible indeed. Not only are Sargassum fish the same colours as the seaweed they dwell amongst, but with spiky oodly doodly bits sprouting from their compact orange and yellow patched bodies, they take on the same shape and texture as the Sargassum as well. The beautiful white patches on this fish’s body even mimic the tubeworms that also live in the seaweed. These are impressive adaptations, but look at this fish’s fabulous fins! Because Sargassum fish spend most of their lives hanging about in seaweed, they do not need to do much swimming. Their fins therefore have evolved to look, and even function, like hands, and they use them to literally pull themselves about in the thick mats. Once I even observed a Sargassum fish hanging from a floating stick with a tiny hand-like fin – just like a monkey would hang from a tree! 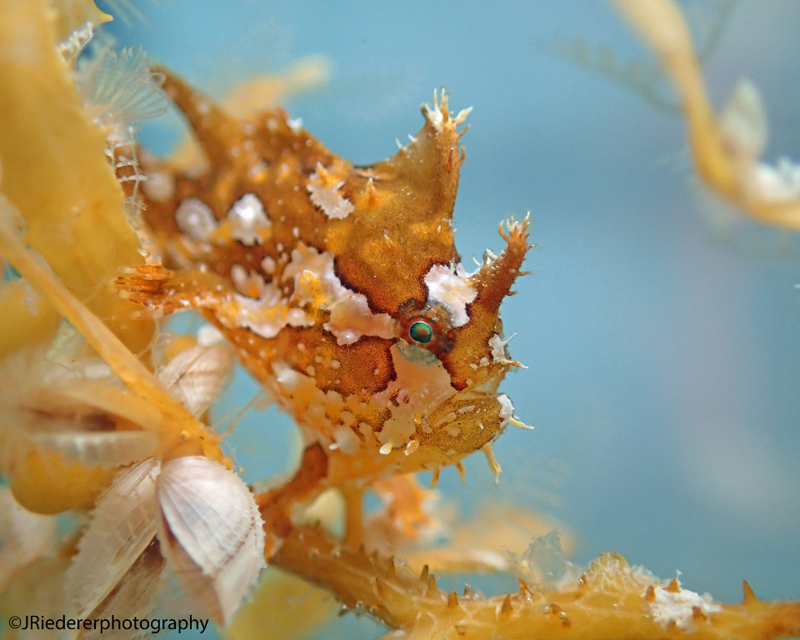 Ranging in size from the teeny tiny to up to 18cm, Sargassum fish are serious predators. Their camouflage not only keeps them safe from other predators, it also enables them to ambush hunt anything that will just about fit in their mouths and happens to come to close to them. On more than one occasion I have observed one Sargassum fish eat another of practically the same size – always as quick as a flash! If you find a few and pop them into a bucket, these aggressive little fish are always fun to watch. Instead of worrying about being in a bucket, they will spend their time darting about trying to catch and eat anything else that is also in the bucket! With so many bits and bobs and such, I do not think even Dr. Seuss could have dreamed of such a crazy character! Nudibranchs [sea slugs] also dwell amongst the Sargassum. Up to 4.5cm in length, they too have evolved to live amongst the seaweed. Sometimes I can’t believe that these crazy looking animals with their fleshy colourful bodies exist! This four cm nudibranch is facing towards the right. What look like horns sticking up from its little cow shaped head are actually rhinophores or sensory receptors. On its back you can see two pairs of cerata or sensory tentacles. 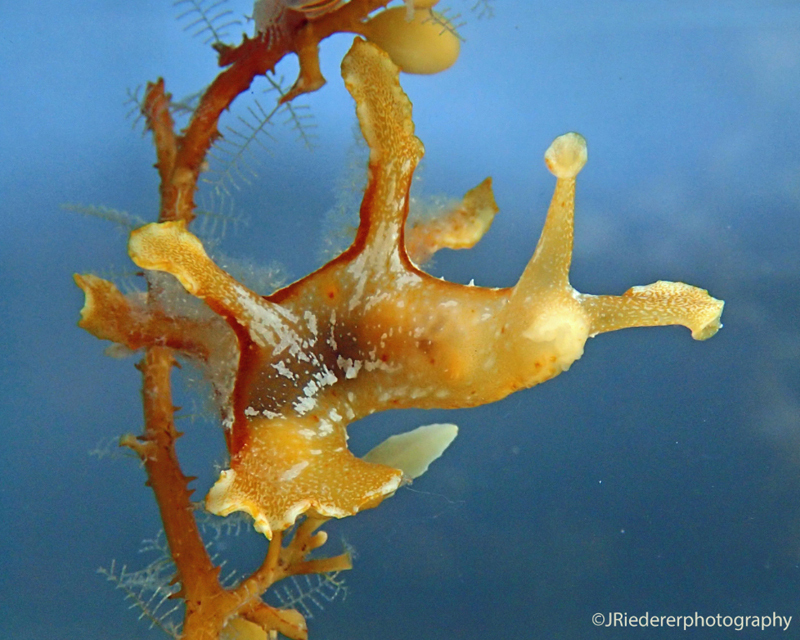 These nudibranchs spend their entire lives in the Sargassum eating hydroids [small colonies of stinging jellies]. They can swim if they have to, but not very well. 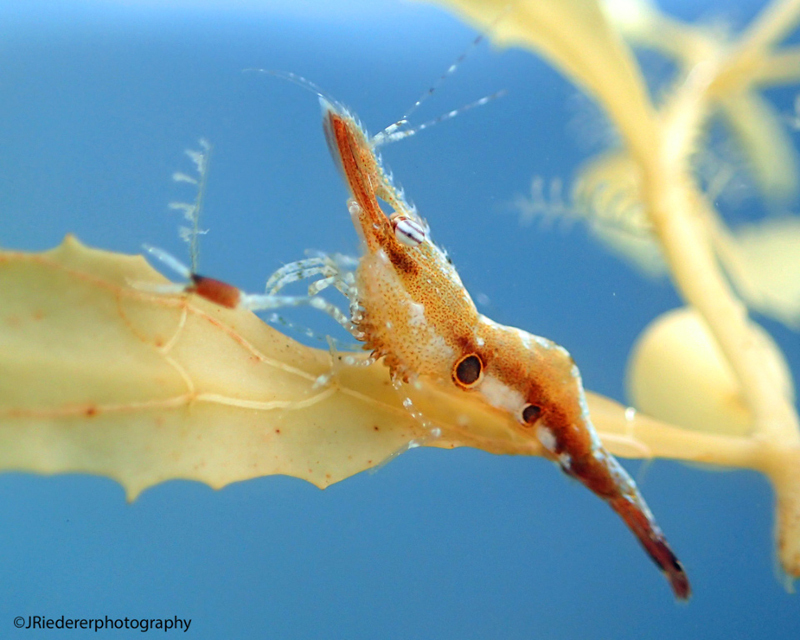 Quite a few different species of shrimp can also be found amongst Sargassum. These shrimp come in an amazing array of colours. The one seen here, Leander tenuicornis, [many of these animals do not have common names] is one of my favorites. Look at its beautiful patterns and delicate little pincers. And then of course there are the crabs of which there are also a few Sargassum species. The beautifully camouflaged one seen here is a Sargassum swimmer crab, and like the blue swimmer crabs that live off Somerset Long Bay, it will be happy to pinch you with hardly any provoking. So when the Sargassum seaweed washes in and piles up on our beaches, it may not bring you much joy, but please remember it once was an important habitat for many species of animals – including species you might like to eat! Fish such as wahoo, dolphin and tuna associate with the Sargassum and juveniles of these species use it to keep safe from predators. Loggerhead, green and hawksbill turtles often depend on it for their survival too. The floating mats provide a safe habitat as well as lots of food for hatchlings. In fact, in December last year I found a three inch long baby loggerhead turtle amongst a clump of seaweed that had washed up on Church Bay. The little fellow was alive when I found it, but sadly despite the Aquarium’s efforts, it did not survive. There is nothing we can do about the seaweed drifting in right now. Instead of hating it, why not use it as an opportunity to learn more about the amazing array of life found in our much loved ocean. You don’t need to have children to take a bucket and a net to a beach. Obviously the seaweed that is still floating and has not made its way onto our shores yet will have the most life in it. Netting a clump with a fish tank or pond net and gently shaking it into a bucket of water could leave you completely surprised by what falls out of it. [If nothing falls out of it, it has probably already been on a beach at the other end of the island]. Discovering feisty little spiky predators, multicoloured nudibranchs with little cow heads, and dozens of species of other super crazy camouflaged critters may give you more reasons to appreciate and love the Ocean. *Please remember that Man o Wars are abundant around Bermuda right now and can often get entangled with the sargassum, so all sargassum explorations need to be done with caution. For more information about Jessica Riederer, visit her website. Very interesting article. Keep it coming Ms. Riederer.